A sphere, a cylinder and 4 extruded rectangles have been used to create the 3D body for an LED. A 3D body is a primitive polygonal design object that is used to represent the 3 dimensional shape of the physical component that is mounted on the assembled PCB. Any number of 3D body objects can be used together to create complex shapes. The available 3D body shapes include extruded polygon, cylinder and sphere. They can be placed into a PCB library component footprint or a PCB document. Their overall shape is displayed when the editor is switched to 3D display mode (press the 3 shortcut). 3D body objects can be placed on any mechanical layer. Placing 3D Body objects to define the components' shape allows the designer to get a real sense of the arrangement and organization of the components on the assembled board. As well as being able to see what the finished board will look like, real-time 3D clearance checking can be performed. Working in the PCB Editor's 3D mode is greatly enhanced by using a 3D mouse, this makes the process of moving and turning the component or board very easy, it is much like holding that component or board in your hand. STEP models can also be used, by importing the model into a 3D Body object. STEP formats AP203 and AP214 are supported. In this situation the 3D Body object simply acts as a container for the STEP model, you cannot graphically modify the 3D Body object or the enclosed STEP model. 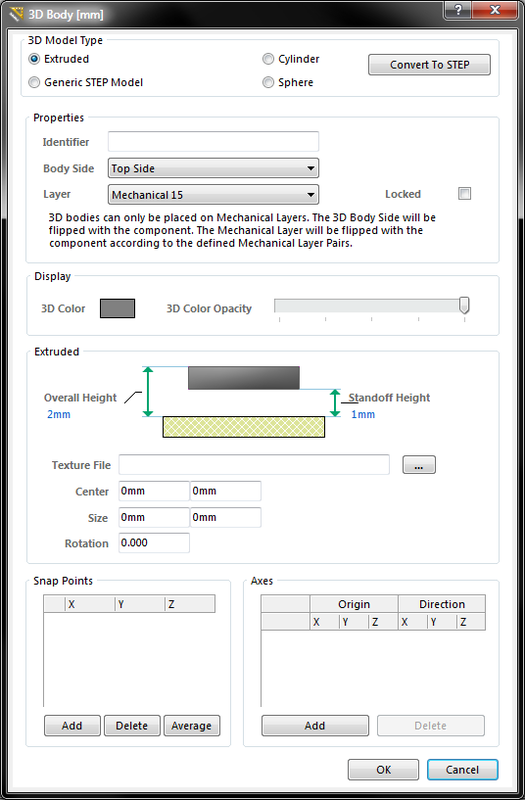 3D bodies are available for placement in both the PCB editor and the PCB Library editor. In the 3D Body dialog select the 3D Model Type from the available shapes: Extruded, Cylinder or Sphere. Each 3D body can be named, this helps identify each element when multiple 3D bodies are placed to create a complex shape. Enter a suitable name in the Identifier field. Each shape must have a defined size before it can be placed. If the chosen shape is Extruded then define the Height, if it is Cylinder define the Radius and Height, if it is Sphere define the Radius. Set the 3D Color and the 3D Color Opacity as required. Note that these can be edited later if needed. Click OK to close the dialog and return to the workspace. If the shape is Cylinder or Sphere, the cursor will be moving in the workspace with a rectangular shape attached. Click to place the 3D body. If the Shape is Extruded the cursor will present, ready to define the the polygonal base shape of the extruded 3D body. Click to define the first vertex. Move the cursor ready to place the second vertex. The default behavior is to place 2 edges with each click (as shown in the first 5 images in the set below), with a user-defined corner shape between them. Refer to the Placement Modes topic below for more details on changing corner modes and the number of edges that will be placed with each click. After placing the final vertex, right-click or press Esc to close and complete placement of the 3D body. There is no need to manually close the 3D body as the software will automatically complete the shape by connecting the start point to the final point placed. The 3D Body dialog will re-appear, ready to configure the next 3D Body for placement. Configure the dialog settings and continue placing 3D bodies, or click Cancel to exit placement mode. 3D body objects can be placed with the display in 2D mode or 3D mode. When a 3D body is placed in 3D mode, object movement is restricted to the X, Y plane, that is the cursor cannot be moved in the Z direction. Generally it is easier to perform initial placement in 2D mode, where objects can more easily be aligned. Press the 1 shortcut key to toggle between placing 2 edges per click, or one edge per click. In this second mode the dashed edge is referred to as the look-ahead segment (as shown in the last image in the set below). This method of editing uses the 3D Body dialog to modify the properties of a 3D body object. The 3D Body dialog can be accessed prior to entering placement mode, from the PCB Editor – Defaults page of the Preferences dialog. This allows the default properties for the 3D body object to be changed, which will be applied when placing subsequent 3D bodies. Double-clicking on the placed 3D body object. Placing the cursor over the 3D body object, right-clicking and choosing Properties from the context menu. An Inspector panel enables the designer to interrogate and edit the properties of one or more design objects in the active document. Used in conjunction with appropriate filtering, the panel can be used to make changes to multiple objects of the same kind, from one convenient location. The Inspector panel is ideal for editing 3D body objects as the changes can be seen in the workspace without needing to close a dialog. For example, if you are aligned two body objects with the display in 3D mode, you can watch as you change the Model Z setting for one of the objects (there is a brief pause after changing a 3D Body setting in the Inspector panel). Extruded objects can also include an image overlaid on the upper most surface. When a Texture File is added it is automatically stretched to fit to cover the entire upper surface of the 3D body, as shown in the image below. This can be adjust by altering the Center location, Size and Rotation settings in the 3D Body dialog. Note that the texture file is embedded in the Library or Board file. 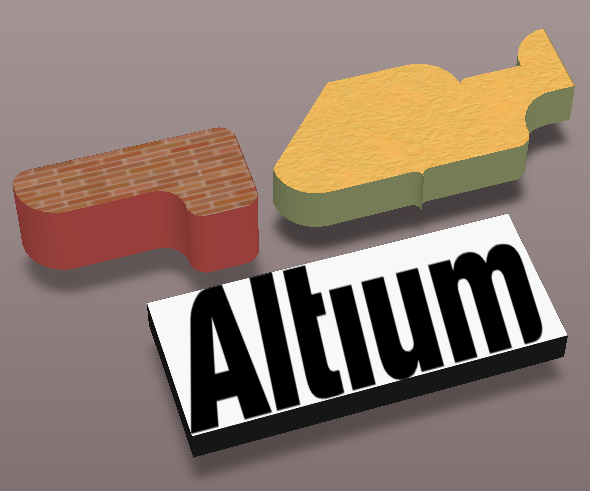 A texture or logo can be added to an extruded 3D Body object. 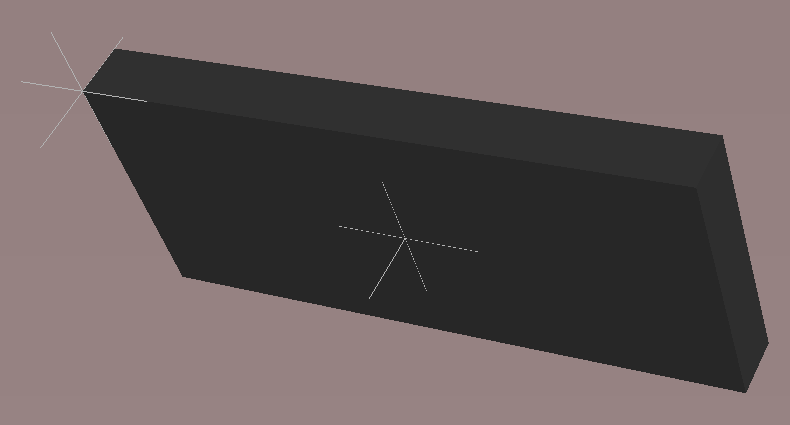 Snap points and lines of Axis can be added to a 3D body. Snap points define points at which the 3D body can be held. When the cursor is moved close to a snap point and a click and hold is performed, the cursor will jump to and hold the 3D body at the snap point. The image below shows a 3D body with 2 snap points defined. Axes can be added to provide a visual aid for positioning and orienting a 3D body. Add Snap Points to a 3D Body to hold the object during positioning. Add Component Clearance design rules to check for collisions between components that include 3D body objects in the X, Y and Z planes. This allows the designer to fit one component over another component. Multiple rules can be defined to handle different clearance requirements. Note that the Design Rule Check does not test for 3D body objects passing through the board.